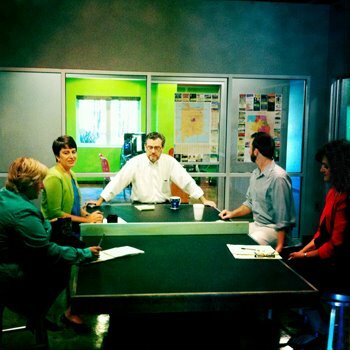 Point A Media's daily meetings inspire interesting conversation. Who needs context when phrases like these arise? To whom would you A-ttribute the following statements? "She was professional, though. Just the one snort." "We've got some pretty good straight-up chicken house photos." "I would eat a sausage split." "That IS a beautiful stomach." "There's some competition involved in being alive." Q. "Is there something cooking in here?" A. "Yes, a turkey." "You just interpret the world around you completely differently." "Sorry, it was the condensed grilled cheese, not the toasted." "Are you good with a chainsaw?" "We were gonna be astronauts, that's for sure." "If I ever change my name for witness protection, it's going to be Chester Drawers." "I'm getting beeped at from all directions." "That guy doesn't look real flexible to me." "You are not allowed to be in on the jokes anymore." "I would not buy a used toilet." "What can we do that's not what we do?" "Snot is the new black." "I'm still trying to figure out what happened to April. I don't remember a full 30 days of it, and I've been sober all my life!" "I'm a Kevin Federline fan." "These grudges aren't going to hold themselves." "Kendal knocked the sticky note out for me." "That's a complicated mental flow chart." "I'll be in charge of the balloon wall." "She makes Eeyore look like Richard Simmons." "You really can't help but smile when someone is cursing yet pointing a possum at you."" "The common thread is absurdity." "You have a bald spot in your fur pants." "I am woman, hear me craft." "Just don't touch anything. That's your tutorial." "If she's having a good hair day in her mind." "I'm done and now you can't see me." "Hobby Lobby threw up in my trunk." "That's about the tenth time someone's said Xanax to me this week." "Don't operate a bulldozer, whatever you do!" "How 'bout 20/20 hiney sight?" "None of that makes sense, but it's poetry and I love it." "If it's free, there's something wrong with it." "That's not a logo, it's a collage." "I think 'someone else is actually getting paid to do this' is the new black." "My sor di douevres is just so awesome. I'm pretty suave." "God, if you can't be a ghost in a cemetery, where can you be a ghost?" "I'm going to travel there by airliner which is what I call my bus." "You have to go to bed before Santa Claus will come." "I wish I had a bulldozer." "You spell like a spammer." "She didn't hoop, but he did." "That is the hardest feather I've ever seen." "Christmas is a lifestyle, it doesn't abide by calendar dates." "You've got to talk to them in the face." "There were so many 'America' moments we were just wow." "If you have enough alcohol in your system, nothing else can get in." "Some people got it at 9 o'clock in the morning." "He is the gift that keeps on giving." "Things have escalated dramatically in the toilet wars." "Every day I find more evidence for my theory that people never evolve past 6th grade." "That's why God made Big League Chew."